Fill in as many of the fields as possible and we strongly recommend you select an image, e.g. either one of your art pieces or the poster for the event. If you want it to be included in the ArtSites Event Calendar and newsletter, make sure the "Show Globally" box is checked. 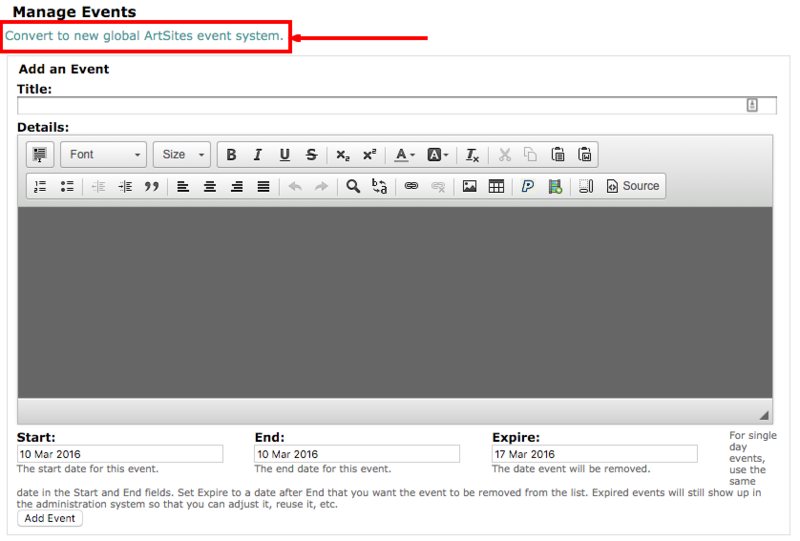 Click the "Create New Event (or Update Event)" button to save your event information. And, voilà, your event will automatically be sent to our new "Events" Calendar on the ArtSites website, where all current and upcoming events will be listed! And, your event will automatically be setup for the "Events" section of the ArtSites newsletter prior to your start date and/or opening reception date! In terms of the newsletter, we want to make sure we have ample room for everyone and that artists' events don't get cut-off. So, going forward, each Event will be listed in the newsletter for a maximum of two weeks. That said, ALL current and upcoming events will be listed on our new ArtSites Events Calendar (even after the initial two weeks).